One thing we rely on is leftovers for lunch. For Menu #14 of our Lunch Box Series, I’ve included our family favorite, Chicken Gyros and Tzatziki. It’s just as good cold as it is hot. For a little crunch and some green, there’s a container of sprouts (these are actually micro-greens) to go inside. I’ve also got some hummus to eat with the carrots and grape tomatoes. -Keep the tzatziki in a separate container. I’ve tried mixing the chicken with the tzatziki a few times and it always makes the pita soggy. -I’ve pictured some micro-greens/sprouts for a green component. Baby spinach or another tender green could be used. 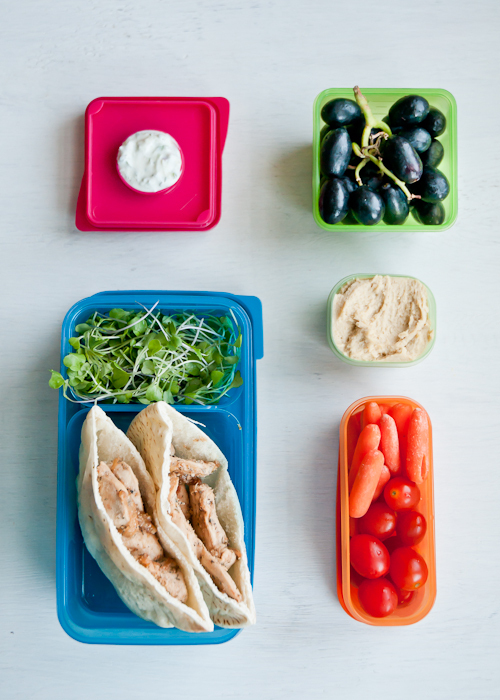 -Make sure to use an ice pack with this lunch. This may be one of my favorites. I sure wish my children would look at something GREEN! I want to eat this lunch. Thanks for the inspiration!